I’ve been using Sabrina cream for about 3 months now. I love how soft and smooth it makes my skin. Fine lines have disappeared. It’s so light weight and totally absorbs into my skin! I highly recommend it! I have been using Sabrina Beauty Simply Beautiful Collagen RX Plus for almost 3 weeks now. It has kept my skin hydrated all day long which is something I always struggle with. My pores are smaller, freckles are lighter, and the fine lines around my eyes have seemingly vanished! 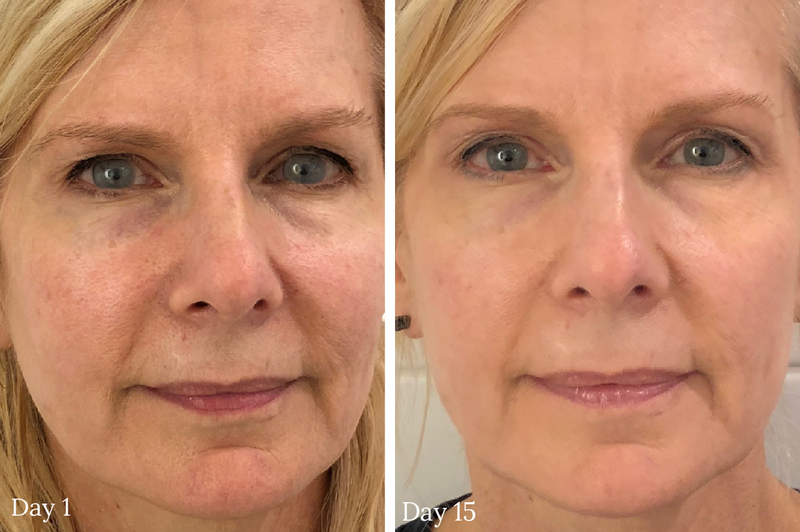 I have even been using Sabrina Beauty Collagen RX Plus on my clients for the past few weeks under their makeup applications to test it out a little further. The verdict – it looks and wears great under makeup! I’ve been using Sabrina for about 6 weeks. I have really sensitive skin so I was a bit skeptical. Skepticism unnecessary. The smell and texture are fantastic. It glides over my skin easily, makes it feel silky and doesn’t clog my pores. I can see improvement in the fine lines around my eyes, mouth and neck. I’m still working through my first jar but already have my backup waiting! So I just started using this face cream on Sunday. My gosh went into work that night and I couldn’t help wanting to touch my face. It was so soft like a baby’s bottom. I am only n my 40’s so don’t have any wrinkles yet. But this stuff really moisturizes your skin and I have dry sensitive skin, no issues with this cream. I will be a continuing customer. I've been using Sebrina collagen skin cream for 2 months and love it. My pores are smaller and my skin feels hydrated but not greasy. Great product! I have started using Sabrina and it does go on very smooth and light weight. I even feel a little tingling sensation. Hopefully that means my skin is coming alive. This is my second day of wearing Sabrina moosturizer. It’s very effective at hydrating my skin and there is no smell. It also seems to be non-irritating. I appreciate this free trial. I like trying things before I buy, especially skin care. Collagen Rx Plus has made my skin so soft and smooth! My pimples have started disappearing. I can't wait to see what all this product does! I'm 24 years old with oily skin, occasional breakouts, and acne scars that have been hanging around for years. I have tried countless products to shrink my pores, get rid of the oil, and fade the set-in scarring. I had grown accustomed to products that were doing so-so, but then I tried Sabrina Beauty. Sabrina has completely changed the look and feel of my skin. I love that it contains safe and natural ingredients, so I can trust what I'm putting on my skin. This product smells incredible and it has not caused my skin to break out (which is huge). I've found my forever skin cream and I absolutely would recommend. wrinkles and cleared away age spots that I've had for years. It smells and feels great on your skin - a little goes a long way. I love this product! I like the cream. I took before and after pictures. I was not able to see any difference on a picture. But other people told me that my ``face looks fresh`` and ``you look different.`` I also feel different about my skin. Its no longer has dry feeling. I also did not get any negative reaction, no breakouts or rushes. So, I am placing my order again. The 50ml jar had last me exactly 2 months with 2-3 applications per day. I started using Sabrina 3 days ago and I love it! I can already tell that my skin has improved. The best thing about it is that it's not heavy feeling under makeup and doesn't leave my face shiny looking. Fabulous product, love the fresh scent, texture is luxurious, a little goes a long way. Can not wait to share my results. I got acne scars on my back from my pregnancy. I have been exfoliating first and then applying Collagen Rd Plus by SABRINA. Within two weeks it has cleared up and I have a pretty back again. I LOVE this cream and going to keep using it on other problem areas! If you have not tried it yet, you should! Worth it!! Amazing product, beautiful team. Once you try it you will recommend everyone you love to use it. 6 weeks into using the cream daily has made an enormous difference! It has taken years off of my face!